Alberto Brunete received his M.S. degree in Telecommunication Engineering and his Ph.D. degree in Robotics and Automation from the Universidad Politécnica de Madrid (UPM) (Spain) in 2000 and 2010, respectively. He is currently teaching at the Escuela Técnica Superior de Ingeniería y Diseño Industrial (ETSIDI-UPM), and researching as a member of the Center for Automation and Robotics (CAR UPM-CSIC). He has done several research stages in Norway (NTNU, 2000), USA (University of Hawaii, 2002), Switzerland (EPFL, 2005) and United Arab Emirates (New York University Abu Dhabi, 2012). 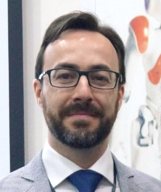 His main research activities are related to robotics and smart environments (ambient intelligence and ambient assisted living), where he has worked on several national and European R&D projects as Researcher and Project Manager in the ICT and Robotics fields. He has been Technical Manager at the Research Center for Smart Buildings and Energy Efficiency (CeDInt-UPM) and Visiting Professor in the Department of System Engineering and Automation at the Carlos III University (Spain), where he has started a Building Automation Lab. In this field he has worked for the SME AtelMedia, leading the home automation section, where he has acquired a deep knowledge of the situation of home and building automation in Spain. He has also worked for the Spanish SME AMETIC as an R&D Consultant. From January 2012 he has been collaborating with the Fundación Alzheimer España as an advisor in ICT affaires, and as a coordinator of the working group on home automation for Alzheimer patients “DomAlz”. In 2016 he has received the prize “XII Edición ABC Solidario” for the project “Fall detection system for elderly homes”. He is a reviewer for several journals and conferences, for ERANet-LAC and for the Spanish certification entity EQA. He has more than 30 publications and has organized two workshops in the RO-MAN17 and EUGEN17 conferences. Emotional storytelling using virtual and robotic agents. International Journal of Humanoid Robotics. Can smart homes extend people with Alzheimer’s disease stay at home?. Journal of Enabling Technologies. Vol.11. Number. 1. Pages: 6 - 12. Evolutionary optimization algorithms for sunlight-based positioning sensor networks. International Journal of Distributed Sensor Networks. Vol.2014.